With the winter currently upon us and the New Year starting, it could be a great time to change your style. The best men’s parka will not only keep you warm in the middle of the winter, but it will also keep you dry and ensure that you have all that cold protection with a little bit of style as well. Battling the winter cold can be a daunting task without the right clothing and with rain usually accompanying the cold weather; it will be helpful to keep all your personal belongings dry as well. We have set out to find some of the top men’s parkas so that you do not have to put yourself through the excruciating cold and to give you a little guideline to ensure that you buy a parka that will provide you with the necessary value. Parkas are like the more advanced version of the standard jacket and they have many extra features that will be of benefit to you in the cold weather. Parkas might be a little more expensive, but they do offer users a lot of multi-functional that will give you value for your dollar. Not all parkas are designed equally and many of them are made with the highest quality of materials to ensure comfort as well as class. In order to get a top parka, you might need to spend a few extra bucks. This could discourage many buyers, but the best thing about any parka is that they can be worn for many winters, turning them into an investment. Waterproof: Having a parka that is waterproof can be a huge benefit, but it will require a better type of material and zipper. Parkas usually have internal storage pockets for your valuable items and with a waterproof parka, you can be sure that everything will be kept dry and out of harm’s way. Comfort: When we look at comfort, we usually look at the interior design of the parka and it is important to find a material that you like. Many types of wool are used in some of the more expensive jackets, while an internal mesh is used in the cheaper jackets. Both could provide you with comfort, but the wool will add a little more warmth. Design: Do you like a longer or waist-long parka? This is something that you will need to be aware off. The shorter parkas are usually more stylish for work purposes and they also have a hoody which can be folded up. The longer parkas are like comfortable raincoat and they will keep you warmer and also keep the water out better. Storage space: Depending on the amount of items that you need to store on the inside of the parka, this could really help you when moving from place to place. Should the parka have a lot of internal storage compartments, you will be able to easily carry around all your belongings without the need of an extra suitcase to keep everything dry. Weight: While the weight might not be a concern to all users, it will have an effect on the parka. If the parka is too heavy and stacked with too many additional features, it will not only be heavy, but it will also be more expensive. When clothing items are too heavy, it becomes a drag to wear and carry around. While most parkas are already great for multi-functional use, we believe that these features will ensure that you have quality from the money that you have spent and that you will be able to wear the parka in more conditions. Parkas are a little expensive, but it is not necessary to always spend a fortune on features that you do not really require. The North Face Mcmurdo Parka II has been perfectly designed for most cold weather conditions and it will not only keep you warm, but it will do so in style. The added fur on the hood has been added for comfort along the ears and to repel any cold weather that enters once you have the hood on and it is almost closed. This will be great for walking through light snowstorms. The 2-way zipper system is great for multi-functional use and if you are not fortunate enough to own a pair of gloves, these zippers will allow you to close the entire parka from the inside. The zippers and the materials have been designed with a waterproof protective coating and you will notice that the water simply slides off the jacket. This will be great for keeping your valuables on you in those cold rain storms and you will also be kept warm. Furthermore, you will also be able to use the emergency neck gaiter to keep your neck dry and warm when the weather suddenly gets worse. This will work with normal t-shirts or with business and formal wear. You might only need to remove your tie to ensure that it comfortably fits inside. Finally, the weight is quite average on the jacket and it will not require you to hit the gym if you need to wear the jacket. The jacket is great for business people, but the material might be little too thin for the ice cold Alaskan winter. You will also be able to buy this jacket at a really affordable price and receive great value for your money. The Helly Hansen 2017 Men’s Dubliner parka has been specially crafted to block out the cold wind when it gets too windy and to allow breathability if you decide to use the parka for outdoor winter use. The parka is very lightweight and this will be a huge benefit to anyone looking for multi-functional use and you will be able to wear the parka just about anywhere. The insulated Primaloft black design is great for keeping you warm on the inside and you will never have to fear any windstorm getting inside. All your interior pockets and your clothing will also stay dry as the parka has been tested to be 100% waterproof. The zippers are easy to operate and this will definitely help in keeping you warm. Furthermore, the jacket also has multiple pockets that you could use and the outer pockets are perfectly insulated to keep your hands warm as well. The internal pockets are great for keeping your media devices and mobile phones and the waterproof feature will ensure that they do not take any damage. Because of the affordable price and lightweight design, this parka will be great for keeping you warm in the outdoors and not cause too much fatigue. The breathability will also help allow air inside when it gets too hot after hiking. The Arcteryx Therme Parka has been designed with style and quality in mind. The parka is a little more expensive, but it does feature some of the most advanced features and special designs. 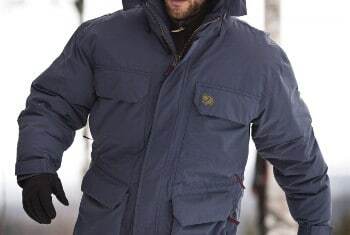 Most of the technology that have been incorporated in the parka has been patented and you are not likely to find this technology in other jackets. This will ensure that you have a unique and special parka. The materials used in the design will keep you dry and also keep the wind out, but it will let in a little wind in the spacious interior to cool you down when it gets hot, which adds to the breathability. The collar has been designed to keep everything out in the case that you encounter a storm and this will ensure that you are always warm. Furthermore, you will be able to make use of the multiple pockets and these are great for keeping smaller items like mobile phones that need not get into contact with any rain. On the exterior of the jacket, you will also be able to use the smaller hand warmer pockets which have been insulated to keep your hands warm. We definitely recommend this parka for urban use and when you look at it, you will notice that it just exerts a lot of natural style. The Patagonia Tres 3 in 1 Parka has been designed with multi-functionality in mind. The parka will allow you to easily switch between warmer and cooler temperature and you will still be able to wear the items. The parka has also been designed with a water repellent polyester to ensure that water will simply run down the material and never penetrate the inner lining. On the inside, you will find multiple pockets in the micro-fleece lined interior. These pockets are just big enough for storing smaller items like mobile devices and this will be a great addition to business people in the colder weather and winter. The parka is also 100% waterproof so that everything on the inside can stay dry. On the exterior of the parka, you will also have 2 hand warmer pockets and because of the lightweight design, the parka will never allow you to become fatigued. The zippers have also been designed with a 2 way feature and this will allow you to zip the parka from the inside and ensure that you are never caught in the cold. Furthermore, we recommend this for urban use, but because of the multiple features, you will also be able to wear this in the outdoors or when hiking, but the material has not been designed to withstand damage from the wild. Designed for everyday use in the winter, the Fjallraven men’s Yupik Parka Coat has the capabilities of becoming one of the very best everyday use parkas that will keep you warm in the winter. The supreme micro loft padding will add one more layer to this already warm coat and you will be able to wear t-shirts underneath this coat in the coldest of temperatures. On the exterior part of the coat, you will notice two large zipper pockets that have been placed on the breast area. These are great for keeping mobile phones on the outside as well as passport documents. On the interior, you will find multiple pockets and the media player pockets are on either side. These are fitted with additional openings to allow earphones to be pushed through and with the waterproof design, you can be sure that water will not enter the coat anywhere and you could listen to music in the rain. The hood has been designed with a soft mesh lining and this is also waterproof. This will be a great addition for going out in the evening and you can be sure that your hairstyle will not be messed up. We highly recommend this for everyday use by the average working person and students that like to go out. 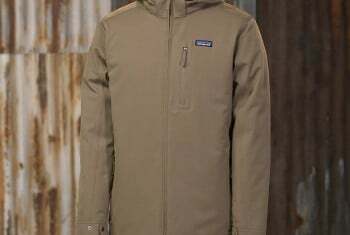 The Patagonia Isthmus Parka for men has been perfectly designed for the average man to use every day. The parka has been constructed with 100% nylon and this will add to the waterproof ability and it will also ensure that none of the water from a treacherous winter storm will be able to do any damage to your media devices or mobile phone. The interior has been lined with polyester fleece and this is guaranteed to keep you warm in the coldest of weather conditions. The parka features multiple pockets to make storing your items easier and all of these pockets can be closed to give you the freedom of mind when walking, knowing that pickpockets cannot get to your belongings. Finally, the entire design is great for giving you breathability and when the wind starts getting harsher, you will be able to close the wind resistant neck padding to create even more insulation. This jacket is great for outdoor and urban use and you will definitely get value for your money. The Patagonia Tres 3 in 1 Parka for men has been crafted with multi-functional use in mind. The 3 in 1 feature will definitely allow you to use the jacket in multiple conditions and this will be a great added bonus to anyone looking for outdoor fun in the winter. The parka features a removable and internally adjustable hood that will be great for keeping out the rain and ensuring that you have raincoat-like features. The hand warmer pockets have been covered with zippers and this will be a huge addition for people without gloves and you will be able to keep your hands warm in colder conditions. Finally, the parka features a multitude of pockets. This will make the carry-a-long process easier and all of these pockets have been insulated to keep the water out. We definitely recommend this parka for outdoor use in the city and in any outdoor areas and with these multi-functional features, you will be able to get a lot of value for your money. It is also worth mentioning that 3-in-1 jackets are a little more expensive, but you will be able to use them in almost any condition and they are a lot more durable and adapt for each of these situations. While some people might only settle for a jacket, those that choose to check out a parka will definitely be able to gain more value for their money. We hope that you understand how much different the parka is to a common and average jacket. We hope that you now have the knowledge to make that perfect choice and get the best parka for your needs. We would like to thank you for reading this article and we believe that you will get the perfect quality for the cold winter conditions if you just follow our features to look for section. We would also like to encourage you to let us know if you have any questions about parkas, or if you think we might have missed a good quality parka.